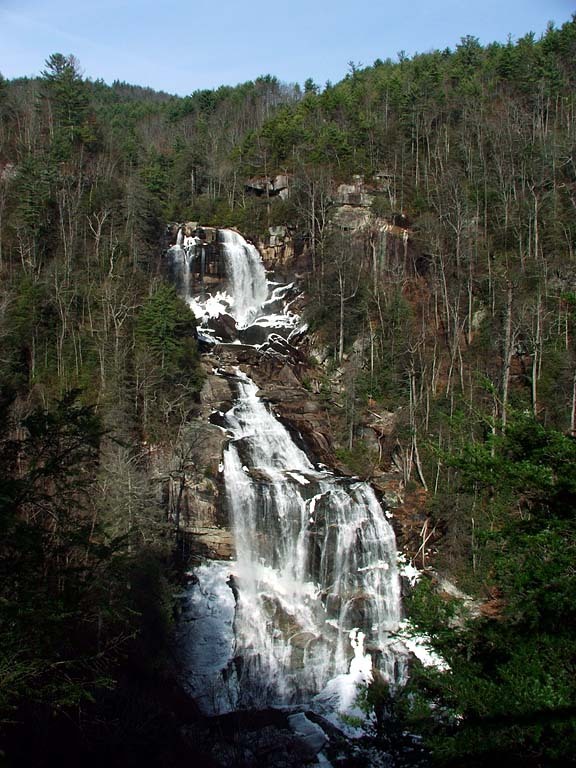 Whitewater Falls, at 411 feet high, are one of the highest pure waterfalls in the South. Over 3.5 miles, the Whitewater River drops 1,500 feet. 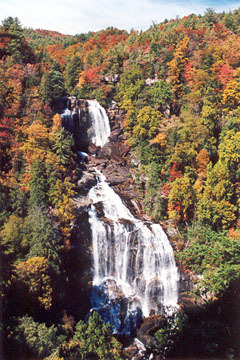 The two largest drops (Upper and Lower Whitewater Falls) are accessible. 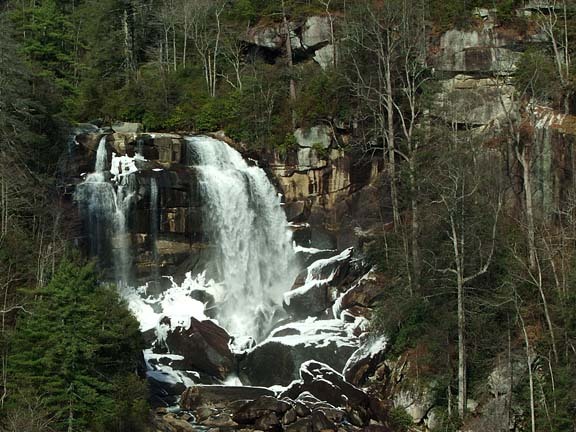 The Forest Service Recreation Area for Whitewater Falls is just across the North Carolina line from South Carolina and is a very popular destination thanks to an easy .2 mile paved trail to an overlook. These pictures were taken from another overlook about 150 steps down the cliffside. While you may dread the walk back up, there are fewer plants and trees cluttering the view. 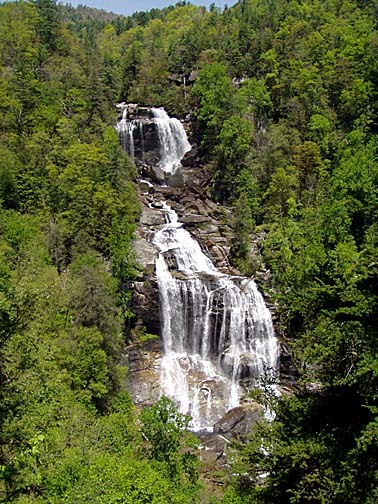 There is also a path that leads upstream of the falls where people then wade to the top of the falls. 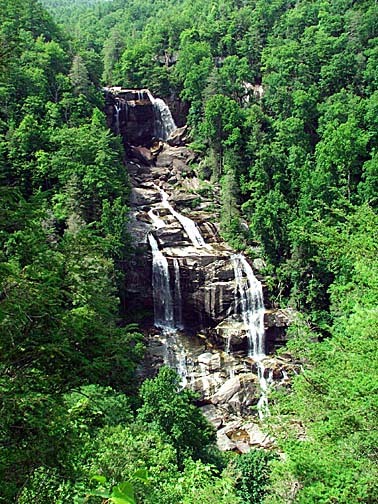 Many people can not resist the temptation to see what you can see from the top of the falls and get too close to the edge. Signs are posted along the trails warning of the dangers and telling how many folks have died falling off the falls (the signs say 15, which might be low). Because so many people have fallen to their deaths, rapelling equipment has been permanently installed at the first overlook to assist emergency personnel in getting bodies out of the gorge. 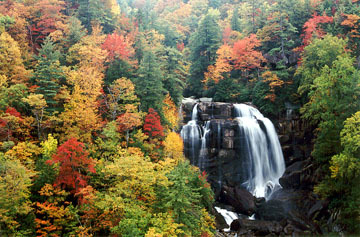 The falls are quite beautiful in every season, but especially in fall and winter. Directions: From Walhalla, take SC 28 north to where it intersects SC 107. 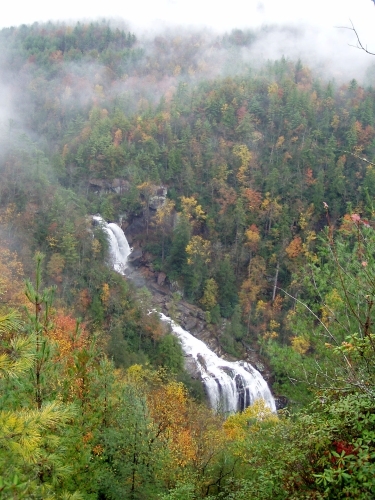 Take SC 107 north for about 11 miles and look for signs directing you to Whitewater Falls. Turn right onto Wiggington Road and follow for two miles, then turn left on SC 130 and follow for another two miles to the parking area. Be aware, SC 130 will become NC 281 just before the parking area. 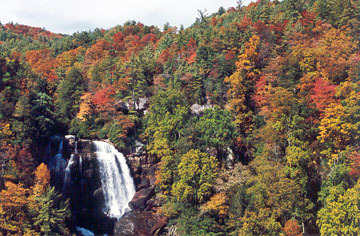 From Cashiers, go south on NC 107 for nine miles, turn left onto SC 130 and follow the signs. From Sapphire, follow NC 281 south for nine miles to parking area.